The desert has long provided a profound feeling for spiritual seekers, travelers, and explorers alike. From the silkiness of the sand to the stillness that surrounds you and the beauty that abounds, it easily entices. Couple that with the mere mention of The Dead Sea, which immediately conjures up evocative mud-riddled images of vacationing bodies floating effortlessly in the ever-still waters. No place is better positioned for an otherworldly float and a stunning Dead Sea sunset than the Kempinski Hotel Ishtar Dead Sea in Jordan. Once you’ve explored Jordan’s breathtaking scenery, natural resources, vast deserts, and historical and religious centers, the likes of Wadi Rum, Petra, and the Jordan River, it’s time to rest those tired tourist toes and go float at the lowest point on earth for quite possibly the greatest high of your life. The Dead Sea, or the Sea of Salt as it is often called, is almost nine times saltier than the ocean. This high salinity prevents animals or any living things from thriving there, hence the name. Yet the sea itself has been a draw for Mediterranean visitors for thousands of years and is said to be one of the world’s first health resorts. Today the Jordanian side of The Dead Sea is a global health magnet and natural resort extending 14 miles long and 11 miles wide at its widest point. At the surface, the sea is set at 1,388 feet below sea level. The dense saltwater enables a seemingly weightless buoyed float. Mind, body, and bones receive a welcome break - there’s nothing quite like it. To take this level of health and luxury a notch further, check in to the Kempinski Hotel Ishtar. The Babylonian-style hotel opened in 2006 and has since housed several Arabian and European royals and cinematic stars during their stints in the Middle East. Of course, odds are you will never see them, as privacy is paramount in this labyrinth of luxury, which offers 345 rooms, villas, and suites for its global guests. If you want to bring your spa experience indoors simply slip in to the Anatara Spa, which opened in 2008; it remains one of the world’s top spas for a Hammam ritual. 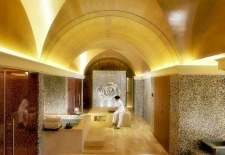 The Royal Hammam Ritual ($190) begins with deep cleansing, steam, and exfoliation to slough off dead skin. This is followed by a full face and body Rassoul mask, rich in minerals and trace elements, leaving the skin silky smooth. Be sure to take advantage of the locally sourced treatments. The Dead Sea Salt Body Scrub ($130) will have you soaking in hydrating oils before salt is used to exfoliate dead cells, leaving the skin ready for regeneration. For a companion treatment opt for The Dead Sea Rejuvenating Mud Facial ($175) complete with a rich Dead Sea black mud mask made with a combination of herbs, essential oils of Geranium, and pure honey designed to nourish and purify the skin, leaving it firmer and smoother. If you’re looking for the balance of East and West, the Anatara Signature Massage ($230) is a perfect blend of both with traditional Oriental medicine and massage techniques. The therapist uses a unique blend of oils with individually and purpose-designed massage movements to stimulate circulation and relaxation. The massage goes together with reflexology to clear blockages of energy in the body along the meridian lines, further enabling an easy flow of energy throughout your channels, creating a platform for optimum health and deep relaxation. 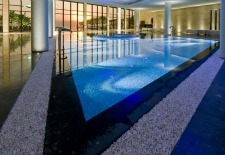 By the time you leave The Kempinski, you’ll be floating on cloud nine, no Dead Sea needed. Ready to Book? Stay in one of the Exclusive Suites for two nights and pay for just one. The package includes a complimentary minibar, high-speed Internet, breakfast buffet at Obelisk Restaurant, and a VIP welcome tray. The 2 for 1 Suites Package is available through September 15, 2011. Alternately, save up to 20 percent on all suites booked a minimum of seven days in advance; junior suites from $650. See our Jordan Travel Guide for more trip-planning information, then use our Travel Search price comparison tool to find the lowest rates on flights, hotels, packages, and more travel deals.